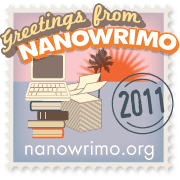 Because of the limited writing window, the ONLY thing that matters in NaNoWriMo is output. It's all about quantity, not quality. This approach forces you to lower your expectations, take risks, and write on the fly. In 2010, we had over 200,000 participants. More than 30,000 of them crossed the 50K finish line by the midnight deadline, entering into the annals of NaNoWriMo superstardom forever. They started the month as auto mechanics, out-of-work actors, and middle school English teachers. They walked away novelists. What I loved most about doing this was the buddy system they had. If you know of other people doing the event, you can become their "buddies," which then allows you to see how far others are coming on their stories. It gives you a friendly sense of competitiveness, not to mention motivation. If you can see how other people are doing, it makes you determined to keep up with them. And it doesn't have to be an original story you're working on. If you wanted to write a fan fiction story, you can do that too. As I said, I really want to do this again, but it depends on my current story. The novel I'd want to work on for NaNo is a sequel to my current story, and I'm only halfway done with it. Plus, I have to do majoring editing, and I want to send out queries to literacy agents as soon as possible. You can't rush editing, and I think it'd be too much of a pain to edit one story, while writing the sequel. And I could try to finish everything before NaNo starts, but I seriously doubt I could get my story to a publishable level in the next 36 days (which is how much time there is before NaNo starts). We'll see though. LOL, I might have to practice my multi-tasking skills come November. But if you get the chance, it's definitely worth participating in.